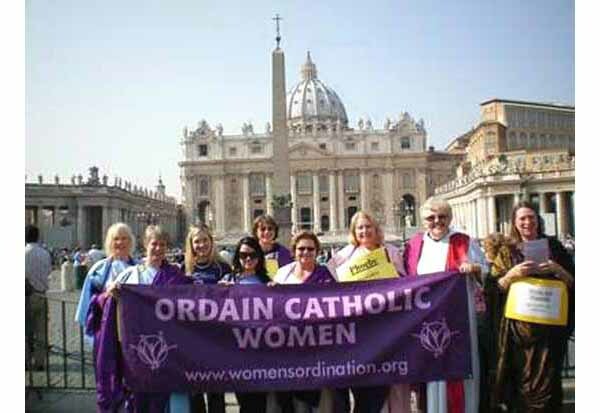 The photo above, shot October 15, 2008, shows nine representatives of the Women's Ordination Conference from the U.S., just one of the many movements that is gathering in Rome now to pressure the Bishops' Synod (October 5-26) to give woman more places in the Church. Other such organizations include the international movement We Are Church, The Purple Stole from Germany, New Wine from England and Roman Catholic Priestesses from the Netherlands. They are asking Benedict XVI - at the very least - to allow more women to "proclain the Gospel and preach at Mass." The feminine presence at the Synod is extraordinary. There are six scholar experts and 19 observers who are women. On October 14, 11 women spoke at the Synod. One of them, Sister Viviana Ballarin, Superior of the Dominican Sisters of St. Catherine of Siena, went so far as to affirm that God is simultaneously Father and Mother, and described the feminine presence in the Church as being her "fruitful womb" where God can meet man. If we continue to travel in the feminization of the Church at the speed we are witnessing today, it seems that it won't be long before we have women priests. Below, we show some examples of how this agenda is being accomplished. 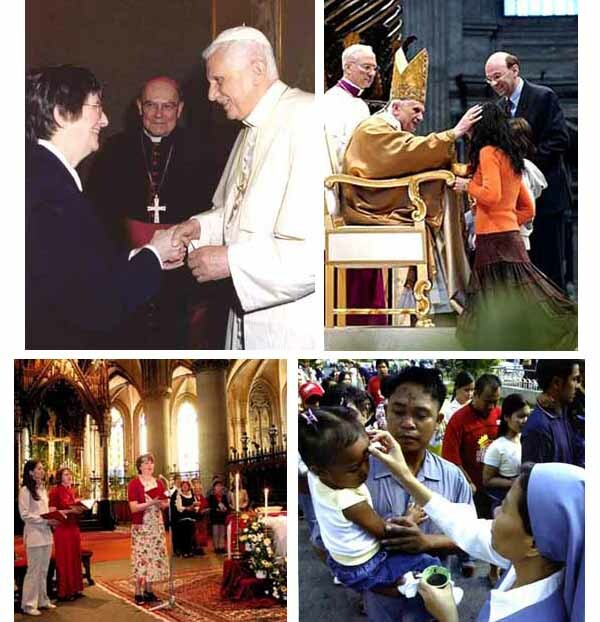 First row at left, Pope Ratzinger greets Sara Butler a member of the International Theological Commission, part of the Congregation for the Doctrine of the Faith; at right, he receives the Offertory gifts from a lady at St. Peter's Basilica; second row at left, a woman delivers intructions to the congregation in Linz, Austria; at right, a sister ministers the Holy Ashes to parishioners in the Philippines. 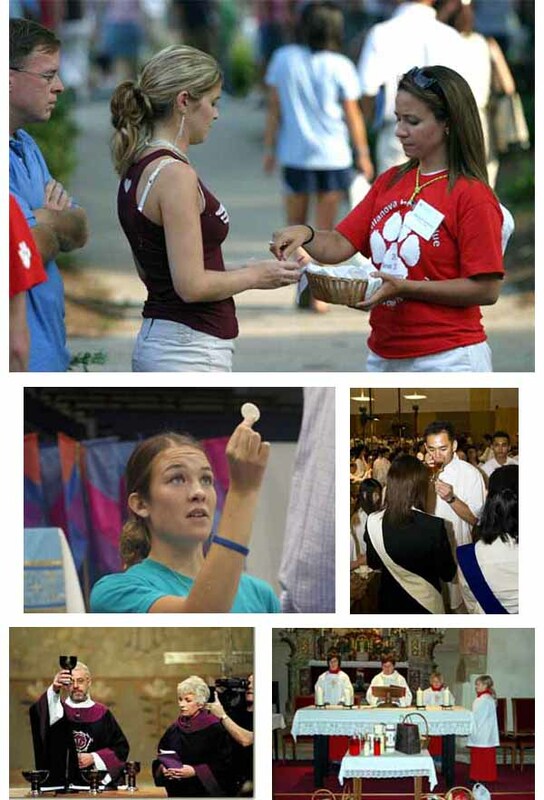 Third and fourth rows, women distribute the Holy Eucharist in Spain, the United States and Singapore; fifth row at left, a woman wears the same vestments as the priest in Holland and serves as his acolyte at Mass; at right, in Austria a woman says the prayers at the altar in a religious service that substitutes for the Mass.